Vous pouvez également utiliser 30000 Kobo Super Points pour l'obtenir ! The modern consumer is no longer attracted by single-minded, predictable and one-benefit-focused brand promises. The old-fashioned FMCG communication strategies based on television, radio and print with constant repetition have become outdated. 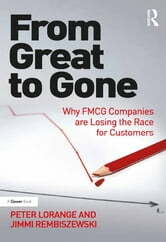 From Great to Gone shows that what’s needed are ’Lego’ strategies, whereby the marketing and communication strategies are built up by many key facets (like building blocks) and delivered to the consumer through a mix of various touch points. Most importantly, you need to leave consumers to put all of that together themselves. 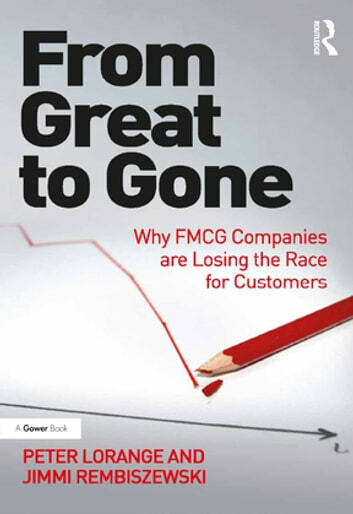 There are major internal and external hurdles to transforming FMCGs successfully into FICGs - Fast Innovating Consumer Goods. It requires new brand strategies and flatter, more top-down than bottom-up, decision-making organisations and a 21st-century model for advertising agencies. Externally these companies need a new route to market through transformation of their old retail dependencies. Changes are also required in all communication delivery, reflecting modern consumers’ connectivity and unlimited access to information. In the book the authors showcase what the winners of the 21st century have in common that has enabled them to become FICGs. New, unimagined models continue emerge, to which, with the authors’ guidance producers and retailers may develop their own sustainable responses.